LOS ANGELES October 4, 2011 - Day 4 of the encampment at city hall ? 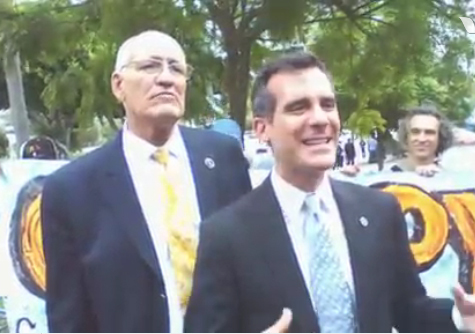 Los Angeles City Councilmen Eric Garcetti and Bill Rosendahl visited the encampment today and expressed their support for Occupy LA. They announced to the crowd gathered around them that they plan to introduce a resolution to the city council tomorrow declaring the council's support for Occupy LA. Upload is audio of the announcement.